SUMMARY: Autobiography of author’s journey through dog training. AUDIENCE: You might enjoy this book as a professional if you want to reflect upon some aspects of our relationship with dogs. I would say that it is more squarely aimed at owners, though. It does not use technical terms. The first chapter hooked me in: I could deeply relate to SC’s close bond with animals from early childhood. Her personal struggle to train without ego (or in my case, without crippling self-doubt) also rung deep. She lost me after a couple of chapters, though, as I found myself increasingly wishing for more substance and less emotional exploration. 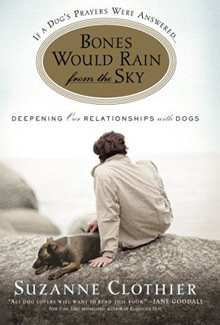 As I understand it, the author’s wanted to write about the dog-owner relationship in a thought-provoking way. And she does: asking meaningful, and often uncomfortable, questions along the way. She did not, however, offer much in the way of verifiable facts or tangible suggestions. To be fair, the book does not claim to either, so my expectations were unfounded. I also found that the author could lose herself into boundless flights of lyricism that gave the book a distinct (from my perspective) New Age philosophy flavour. Not exactly a treat for this fact-obsessed skeptic. Finally I found the standards of the ideal dog-owner relationship sooooo depressingly high. It left me feeling that my up-till-then satisfying relationship with my dog was somehow insufficient. Whilst reading this book, I also caught myself judging other dog owners for failing to meet these standards. In short: I did not enjoy that book, but it receives critical acclaimed in the field. So it could well be a matter of personal taste. Pick up a copy and let me know. Browse the Book Review archive. Genre: autobiography. Author: Clothier Suzanne. Reading Level: Owners. Star: 2. Bookmark the permalink. Post a comment or leave a trackback: Trackback URL.